On Wednesday, we saw the end of something that means a great deal to me. Futurama is a TV show. 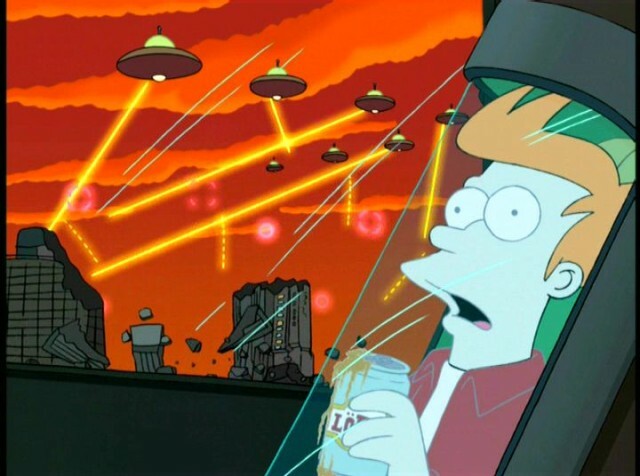 Futurama is a cartoon. For those who have continued reading, well then maybe you understand. We as people gain inspiration from things we encounter in our daily lives. We become engineers, writers, filmmakers, game designers, artists and so on, and owe our inspiration to what we live. Millions of people got to live Futurama the way I did. In 1999, the show first aired scaring the crap out me. You see, the first episode mentions the Y2K problem a few times, and as a gullible nine year-old Latino kid from LA I thought that the end of the world was near. Suddenly, Fry traveled to the year 3000 and my eyes couldn’t close. I was there. 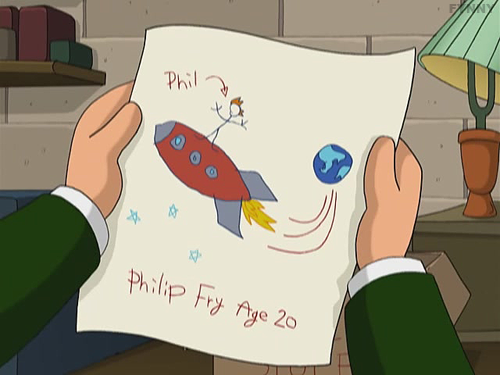 I was frozen in my seat watching Fry get frozen until the future was his present. That future was my present time as well for those 30 minutes. I was no different from him. I laughed until I cried. Then I cried because I was actually sad. 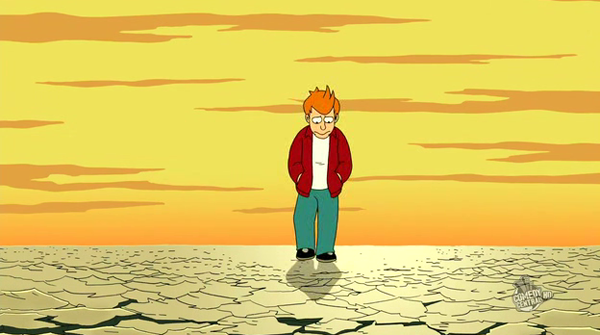 The show continued to really manipulate my emotions in episodes like “The Luck of the Fryrish” and “Jurassic Bark.” I remember thinking that Fry wasn’t that much of an idiot and that he didn’t deserve the amount of ridicule that he received from other characters. Silly, I know. Why? 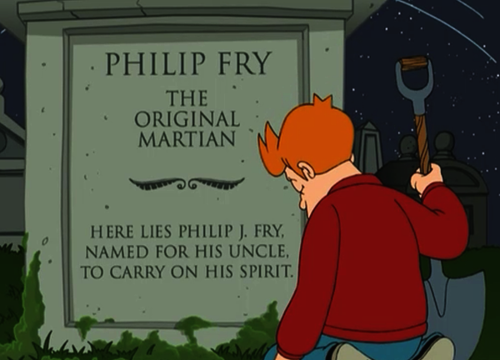 Well, in the episodes that reveal things about Fry’s past, we learn that he wanted to be an astronaut but his father always put him down. He didn’t have the right bolts in his head to accomplish such a feat. Now, I didn’t grow up with a father, revealing I know, but I too wanted to be an astronaut as a kid. Instead of my father, educators put me down my entire life. Teacher after teacher from elementary school to high school, I was laughed at when I said I wanted to do something like be an astronaut, work at NASA, or be a game designer. 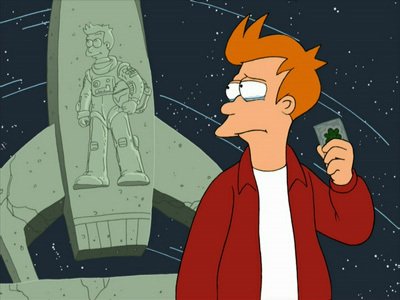 Fry got to go to the Moon, Dammit! That’s awesome! He got to have snoo snoo for who knows how long in the Amazonian planet. He got to be best friends with a foul-mouthed robit, as Zoidberg would say. He got to travel back in time and forward in time. He even took part in the 1947 Roswell incident. That hit home because the moment I remember becoming a nerd was in 3rd grade when I bought a book about aliens and read about Roswell. I was hooked on alien theories for life! Fry was cool. He was a likable and older version of me. This was MY show. When the show got cancelled the first time, something inside me died. However, a movie was quickly released filled with as much fan service as die-hard viewers deserved. I was happy and felt that it had a fitting ending. Then three more movies were released! Again, another fitting ending. Thanks to DVD sales of the seasons and movies, Futurama was back, baby! Again, I laughed until I cried, again I cried from being sad, and now with social media, I was going to do my part to help keep the show alive. For the past few years, I spammed my Facebook friends’ newsfeed with constant reminders of Futurama’s weekly new episodes. I did my part. I did what I could do. Then, a few months ago I read that this was the end. The show was going to have a final farewell. “No! No!!!!! No Dammit!!!! This CAN’T be happening!” I screamed inside my head. I watched every episode alone, the same way I did when the first season aired. You see, back in 1999 my sister (who is now my best friend) was only five years old and my brother didn’t really have a relationship with me. My Spanish wasn’t up to chops to fully express myself with my mother. So, basically I was lonely. I had friends in school, but not really outside of school. I was a lonely kid and Futurama helped me escape the same way video games helped me escape. I was in the future 30 minutes every week. And now…I’m not. The final episode, “Meanwhile,” ended with an eye-watering conclusion. It was difficult to stay strong and say goodbye to what was my best friend when I was nine years old, when I came back to Santa Cruz, CA in 2011 and slept on a couch, and even now. Futurama was mine. Luckily what we live becomes our inspiration in whatever field we choose to pursue. I will one day create the games and write the stories that Futurama inspired in my head years ago. Funny, isn’t it? The show is over, but its impact is going to live in my brain for a long time. I’ve got notebooks filled with ideas that I conceived by viewing the show. I can’t wait to show them all off. Goodbye Futurama! Thank you for being my favorite show of my entire life. I’ll make you proud. I’m not sure why people didn’t watch enough and keep the ratings up. Some things were done wrong, or were things done right? I’m not sure. I’m glad you enjoyed the article and commented; it means a lot. We should definitely avenge them. There is a petition going around to have Futurama as a Netflix show. You should sign it! In any case, next year there is going to be a Simpsons/Futurama crossover episode on the Simpsons.